Any tips for setting up at a convention with a vendor table? -have a big sign with your brand name. 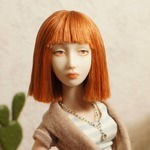 -Use physical barriers like glass to protect dolls. -be very friendly and not at all pushy when people walk by. -Fill your table. If you only have a few dolls, add a view book about how they are made, postcards, your sketches, etc. -organized table, if you have a lot of stuff like wigs, accessories, etc, make sure it is organized and tidy, so people can see everything well. -put little signs with your brand name next to the dolls or other points of interest. Then when people take a photo, the brand name will end up in their photo. Later, when they admire their pictures (or they post them for others to see), people will be able to tell what booth it was. -your own appearance makes an impression too. I always dress myself like I'm going to an important meeting. For me that means nice clothes, makeup, and tidy hair, but you should follow your own style. It's psychological for yourself too. If you believe you look Professional it will be easier to act Professional. -have fun! Conventions are mostly about meeting people and getting your brand name out there. Enjoy the process! Thank you, Allurose! Excellent tips, very much appreciated. Allurose, that was great advice! Definitely use glass or cases to protect them if you don't want people touching! 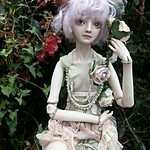 I just got back from a doll show this weekend and I didn't have them in cases...people had their hands ALL over them! Oh my gosh, I was just having heart attacks all day! Meeting people was the best part though. People love to chat and discuss, be prepared to be talking all day! Also, bring plenty of business cards! I've vended at 5 blythe conventions now, and I find searching through the "blythecon" or "blythefest" tags beforehand can be helpful for inspo and idea's on how people have set up. Some go out of their way to create elaborate diorama type tables, some just have one or two cute room-boxes to display their dolls. Having your name displayed near the items that will likely be photographed the most is a GREAT tip from allurose! People won't remember everyone's names or vending names, and many will just upload the bulk photographs without editing them and entering every single person's name as a title. I would suggest clear prices so people can see straight away. Many will be too shy to ask, and just feel "oh I couldn't afford it anyway" without knowing. I did read an article on selling to introverts, and it suggested having prices clearly marked, as some people are too shy to ask, and I am totally like that! I'm mulling over ideas for a table setup, right now Im just trying to get the dolls fiinished!